When we Downey-ites think about heading to the beach, we generally think of the beaches to the south of us: Seal Beach, Bolsa Chica, Huntington, and so on. We don't general think of heading directly west. But because the Los Angeles coast goes at a 45-degree angle, from northwest to southeast, heading either west or south will take us to the Pacific Ocean. And so, the other night when we arrived at the airport too early to meet our friends' plane, we decided to keep going west. Just a mile to the west of Los Angeles International Airport (LAX), and directly under its flight path for take-offs, lies Dockweiler State Beach. 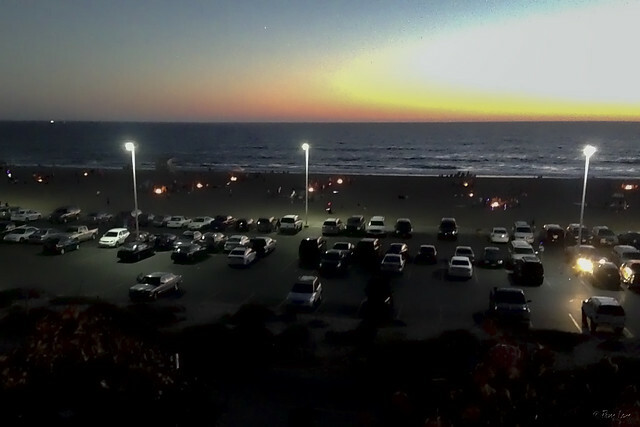 We arrived just after sunset, to see that the beach was filled with people crowded around bonfires, enjoying the view and the warmth, and probably some hot dogs and some-mores. LAX doesn't have a cell phone waiting area. Maybe this is the next best thing. It certainly beats driving around (and around) inside the airport area itself!